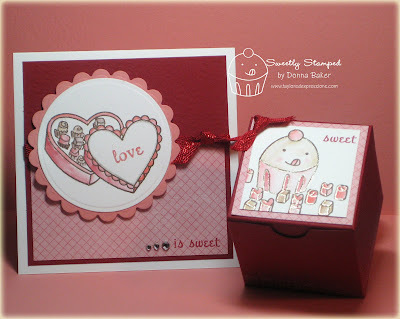 Stamp a Sweet Impression: Sweets Anyone?? Since Valentine's Day is fast approaching, sweets are on the mind! Well, let SASI stamps satisfy that sweet tooth! 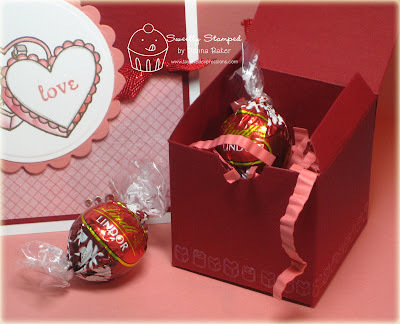 I have a box of chocolates card & treat filled with chocolates to share with you!! I used Love is Sweet for this cute cuppie ensemble as well as some cardstock (scallop mat & dp) from the Valentine's key ingredients. The red used on the card & and favor box is blush red dark from the Christmas key ingredients, as well as the red glimmer ribbon. Super cute set Donna. Love the great colors and of course the yummy images and chocolate. :o) TFS! What an adorable set Donna! Love the dp and the little box is just so sweet! Love your set, Donna!! So adorable!! Oh so sweet, awesome job.